The Perilous Secrets of Wilford Manor is First Volume of the Doombringer Saga Campaign Arc. This adventure module that can be used in any D&D 4e Campaign Setting. Something strange is happening in the sleepy hamlet of Wilford. No one at court has heard from the Baron in years. And now the young knight, Tulwen, sent to investigate is long overdue. A powerful Earl has sent you to find his son, which would seem a simple quest, but there is so much more to The Perilous Secrets of Wilford Manor. The Doombringer Saga is a series of adventure modules designed as an entire campaign arc for Player-Characters from Level 1 to Level 30. Although the First Volume is created for the beginning of the Heroic Tier, the adventure is epic in scope. It will introduce Player-Characters to a world-shaking threat which will not only decide the fate of the Mundane Realm, but that of the Feyweald and Shadowmoor as well! An engaging storyline that can be played as part of the Doombringer Saga Campaign Arc, or as a stand-alone adventure for five 1st Level Characters. A back story complete with adventure “hooks” to introduce Characters to The Doombringer Saga. New Monsters, Hazards, and More! 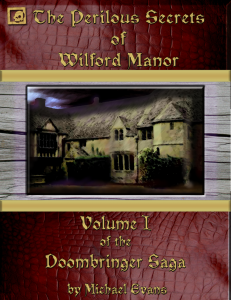 The Perilous Secrets of Wilford Manor is now available from RPGNow!